When beginning this painting, I have jokingly referred it as “my first serious” oil painting. This is also the image I used for the postcard/email/social media invites, website Home page, and any promotion for the “Ukazoo Art Exhibit”. Nod of thanks to close friends, Lee, Deborah and their daughter Katelyn, as well as their family members and close friends that attend their Thanksgiving dinners each year. Over the past several years, I have joined them for this Holiday dinner and part of the evening has become my annual “Show & Tell” of recently completed art work. 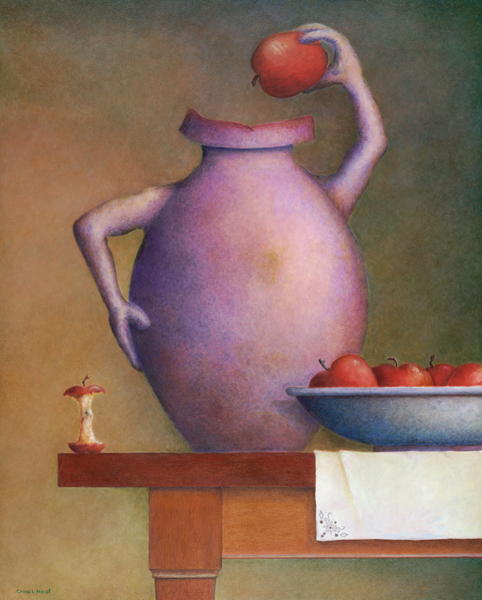 Along with a few other pieces, “Still Life” was the most recent finished painting. It is their viewpoints and encouragement of my art during these once a year displays that always add a boost of confidence to my motivation to continue exhibiting my artwork publicly. With “Still Life” as the third finished painting (since the Antreasian Gallery exhibit), a fourth in progress and another painting being prepped to start, it was during this evening that I knew that I would start to consider the next location for another exhibit. Are jugglers with flaming batons. And again, still it is difficult for me to make such a loud announcement, so softly I say, please keep following my journey, more neat art stuff is on the way.